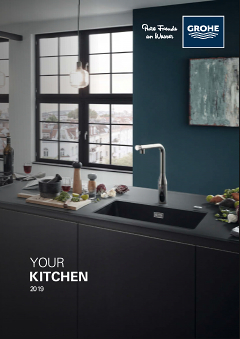 In the same way that a great meal is a result of carefully balancing flavours, textures and nutrition, your kitchen faucet should be a balanced combination of design and practical features. Well considered details that work for you and the installation requirements of your kitchen. Fortunately, Eurodisc Cosmopolitan offers enough choice and design nutrition to satisfy the most demanding chefs. In developing Eurodisc Cosmopolitan, we thought about chefs who are not so easily satisfied. These discerning individuals will recognise the attention to detail and nuances. The high-gloss chrome finish elegantly emphasises the tapered edges. You can expect the same perfection in the functionality of the faucet as in the form. You can choose between three different spout heights, different versions and countless installation options. Whatever choice you make, you are guaranteed an attractive appearance and easy operation over the lifetime of the faucet, thanks to GROHE SilkMove® cartridges and GROHE StarLight® chrome finish.